Those worn out denim pants can be reused to create a rug. 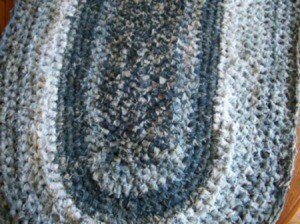 This guide is about crocheted blue jeans rug. This rug is made from about ten pairs of old, worn denim blue jeans in various shades of blue. Launder the old jeans, then cut seams out of each leg. Cut each leg into a continuous 2 inch strip. Sew each continuous strip together with the sewing machine and wind into balls of the same color. Separate light colors from darker colors, having different fabric balls to work with. To begin the rug, I crochet about 20 chain stitches, and turn, doing either a double or half-double crochet stitch, working and turning the rug each round until it is the desired size I want. Add each separate color of fabric as necessary. When adding a new color, make sure you machine stitch the strips together to join. Otherwise, the stitch will unravel. When the rug is finished, tuck the end piece into a stitch and sew in place. This rug is best handwashed and does stand up to use. It doesn't do well in machine washing, so I soak it in the bathtub and drip dry. I used regular jeans for this rug, but the stretch denim jeans will work as well. Other colors of jeans can be used of your choice. I started making denim rugs because the charity I volunteer at gets donated clothing and a lot of the jeans saw better days and since i hate to see waste I decided to try making rugs. I don't make a continuous strip but rather join my strips by cutting a small slice into the end of both strips and key hole join them. I also decided i wanted color so I added colored coordinated fabric strips by crochet chain stitch in the pillar posts of my denim stitches. Same as adding a chain stitch to a crochet or knitted for decorative trim. You can use up some really ugly prints because you are after the color not the print. I look for discount fabrics because it is easy to use up 5 yards of the colored material. My current rug is about 5 feet across and weights about 25#. It will be 7 feet across when I am done. Each of my children and grandchildren will get one as they get married. Another way to wash these heavy monsters is to take it to the car wash and lay it over the side of your pickup and then I lay it out on a tarp to dry in the sun. 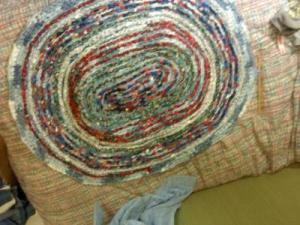 Here is a picture of my rug in its infancy, about 24" wide. How do I make a denim rag rug? Is there a special tool to roll the material? If not, how do you keep the cut edges from showing? How wide would I cut the strips, etc.? Please advise. Thanks very much. It has been ages since I braided a rug, but will try to help. The width of the strips depends on the thickness of the braid/rug you desire. The strips, if they are folded inside like bias tape, will not have any raw edges. You will want the strips wide enough to make a rather plump braid or you will be forever getting it sewn together. Sew the strips end to end at a diagonal and don't have all three strips ending at the same place so the braid will continue smoothly. You can also just overlap the strip before it is folded and you can braid right on. Again, don't have the ends all at the same place or it will be a little weak at that point. I would like to know how to make a braided denim rug. Has anyone ever done this and if so, could you please give me instructions?